This product was added to our database on Friday 12 December 2008. 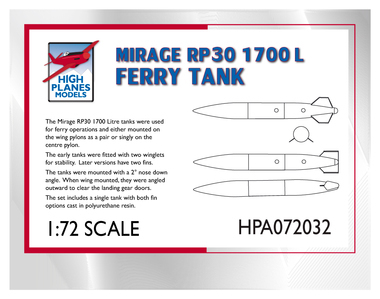 This High Planes accessory includes a single 374 gallon / 1700 litre drop tank for the Mirage III/5 family. This tank was used for long distance mission and ferry operations by most countries that flew the Mirage family. The tanks were either mounted under the wings in pairs or carried singly on the centreline. The tank is cast in polyurethane resin wih both early and late style fins.